The great Christmas Shoebox roundup 2018! Our shoebox appeal officially ended on 20/12/18 but still the shoeboxes keep coming! What can we say but an enormous and heartfelt thank you on behalf of the cats. You've been so generous and these shoeboxes will bring joy and fun to the cats in care at Christmas time and beyond. There are lots of things in the shoeboxes including toys, food, treats and blankets. It's great to send a newly adopted cat off with a favourite toy and blanket so they have something familiar and with their scent on. We all know how so many cats love a cardboard box and we appreciate that the boxes are donated to cats in need with love and good wishes. We’ll be showing photo's of the foster cats enjoying their Christmas boxes when the big day comes. Thank you from Gosport CP. 30/12/18 And even more shoeboxes collected for the cats with all 5 of these shoeboxes very generously donated by Gaille. 21/12/18 The response to our appeal has been amazing, here are more we've received including from Valerie & Matt Ralph. You can see that Heather's cat Minnie is on quality control patrol again! 20/12/18 It's officially the final day for our appeal and these lovely shoeboxes were collected yesterday from Alver Vets Stubbington. We're always happy to receive further donations. You can send us a private message or phone Chris on 02392 582601 to arrange a drop off point. This one has really touched our hearts. Thank you so much Freya - it's lovely to know that Chloe has such a kind owner. These shoeboxes were also collected today (20/12/18) from our drop off point with Mollie who in between fundraising most days with her garage grotto sales kindly donated a shoebox from her cats, Brian & Simba. Thanks too to Jackie Barge and her cat for taking the trouble to make up a shoebox (there are a lot of clever cats out there!) and to the Stanhope family. 19/12/18 To receive so many shoeboxes for the cats has been overwhelming and will make a difference to cats in care over Christmas and through the months to come. Just when we thought all your kind donations had been received, more shoeboxes have arrived and will be photographed and included on this page, please bear with us! 18/12/18 We just can't say thank you enough for the way you've responded to our shoebox appeal. These lovely gifts were left at Alver Vets Stubbington and Gosport respectively. Pebbles who was adopted on Friday by Jamie went home with her Christmas shoebox ready for the big day - thank you Laura, it was your lovely Christmas pudding wrapped shoebox! 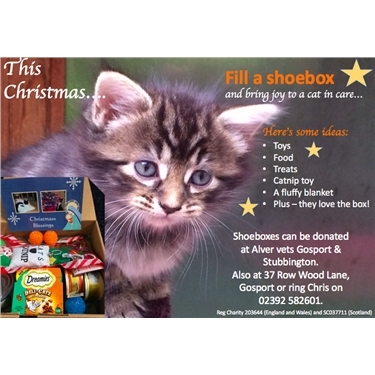 14/12/18 more fabulous shoeboxes donated at Alver vets Gosport & Stubbington during the past week, they really are very much appreciated. 12/12/18 a bumper day for shoeboxes! A huge 'thank you' to our volunteer Toni and her friends and family who have kindly donated these lovely shoeboxes for our appeal. Bev and Rod, Judith, Matt and Sam, Robin and Toni - your generosity will really brighten up Christmas for our cats in care. Also Sharon and her cat Lionel have donated a shoebox especially for Lucky, newly arrived in CP care after being involved in a road accident. 10/12/18 another day at the office and more lovely shoeboxes. Thanks to Sharon at DWP for the Santa wrapped box and to Laura from Sussex who adopted naughty tortie Millie from Gosport CP a few years ago for the Christmas pudding box. The cats will have fun with them. 07/12/18 former CP cat Monty and his family, the Kings, have kindly donated this beautifully wrapped box. 06/12/18 Thank you to Mrs Clarkson for a shoebox full of goodies for the cats in care. We also received boxes from Coral Bale and Nicola Dyson, thank you ladies! An anonymous donation of ‘Tiger’ cat food in the collection box at Stubbington Alver so again thank you very much. 04/12/18 a box set! A delivery of 4 shoeboxes for the cats from Rachel, whose generousity is appreciated. 27/11/18 The first shoeboxes have arrived-thank you for your generousity as well as the time you've spent making the boxes up. The cats will love them! Please be assured that former foster cats Loki & Minnie are shoebox inspectors from a distance only. Heather's safely stored the shoeboxes out of their reach until the boxes are delivered to the foster cats.